The flag of Benelux is an unofficial flag commissioned by the Committee for Belgian-Dutch-Luxembourgian Cooperation in 1951. It is an amalgam of the flags of the member states: Belgium, the Netherlands, and Luxembourg. The red stripe is from the Flag of Luxembourg, the blue stripe is from the Flag of the Netherlands, and the black stripe and yellow lion rampant are taken from the Coat of arms of Belgium. The lion also historically represents the Benelux - or in other words, the Low Countries - area as a whole, since each constituent nation possesses a coat of arms featuring a lion rampant facing left (Leo Belgicus), which during the 17th century already symbolised the Low Lands as a whole or in part. ^ "Benelux". leiden.courant.nu. Retrieved 2015-05-21. The flag of Luxembourg consists of three horizontal stripes, red, white and blue, and can be in 1:2 or 3:5 ratio. It was first used between 1845 and 1848 and officially adopted in 1993. It is informally called in the country, «rout, wäiß, blo,». The national flag of the kingdom of Belgium is a tricolour of three bands of black, yellow, and red. The colours were taken from the coat of arms of the Duchy of Brabant, and the vertical design may be based on the flag of France. When flown, the black band is nearest the pole. It has the unusual proportions of 13:15. The coat of arms of Belgium bears a lion or, known as Leo Belgicus, as its charge. 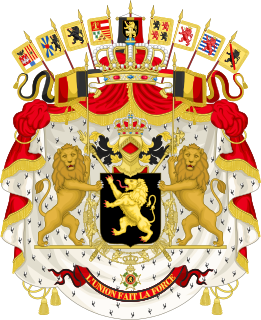 This is in accordance with article 193 of the Belgian Constitution: The Belgian nation takes red, yellow and black as colours, and as state coat of arms the Belgian lion with the motto UNITY MAKES STRENGTH. A royal decree of 17 March 1837 determines the achievement to be used in the greater and the lesser version, respectively. The German-speaking Community of Belgium or Eastern Belgium is one of the three federal communities of Belgium. Covering an area of 854 km2 (330 sq mi) within the province of Liège in Wallonia, it includes nine of the eleven municipalities of East Cantons. Traditionally speakers of Low Dietsch, Ripuarian and Moselle Franconian varieties, the local population numbers over 75,000—about 0.70% of the national total. Greater Netherlands or Dietsland ("Dutchland") is a hypothetical monolingual polity formed by fusing the two Dutch-speaking regions of Flanders and the Netherlands. The concept was originally developed by Pieter Geyl, who argued that the two only separated during the Eighty Years' War against Spain in the 16th century. 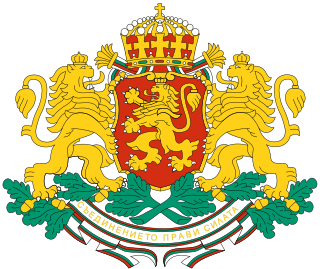 The coat of arms of Bulgaria consists of a crowned golden lion rampant over a dark red shield; above the shield is the Bulgarian historical crown. The shield is supported by two crowned golden lions rampant; below the shield there is compartment in the shape of oak twigs and white bands with the national motto "Unity makes strength" inscribed on them. 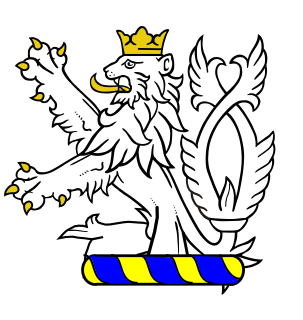 The coat of arms of Luxembourg has its origins in the Middle Ages and was derived from the arms of the Duchy of Limburg, in modern-day Belgium and the Netherlands. In heraldic language, the arms are described as: Barry of ten Argent and Azure, a Lion rampant queue forchée Gules crowned, armed and langued Or. The Leo Belgicus was used in both heraldry and map design to symbolize the former Low Countries with the shape of a lion. Black for the people of Kenya. Red for the struggle for freedom. Green for the agriculture and natural resources. White for unity and peace. The flag of Flanders, called the Vlaamse Leeuw or leeuwenvlag, is the flag of the Flemish Community and Flemish Region in Belgium. The flag was officially adopted by the Cultural Council for the Dutch Cultural Community in 1973, and later, in 1985, by its successor, the Flemish Parliament. 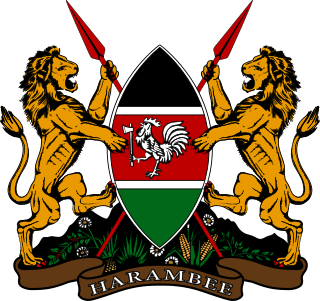 In 1990, also the coat of arms was adopted as an official symbol. The flag of South Holland was adopted on 15 October 1985, replacing the flag used since 22 June 1948. The coat of arms German state Thuringia was introduced in 1990. Like the 1949 coat of arms of Hesse it is based on the Ludovingian lion barry, also known as the "lion of Hesse", with the addition of eight mullets. The Flag of the province of Friesland or Frisian flag, is the official flag of the Netherlands province of Friesland. The Arms of the Flemish Community are: Or, a lion rampant sable, armed and langued gules. Although the lion has been in use for almost nine hundred years as the arms of the Count of Flanders, it only became the official symbol of the Flemish Community in 1973. At present its form and use is subject to the Decree of 7 November 1990.